Think of your favorite on-the-go meal. Maybe it’s a thick, juicy burger and some delicious fries. Perhaps it’s a foot-long sandwich loaded with fresh ingredients. Or maybe you long for a giant burrito and a bag of freshly-made tortilla chips. Food packaging is probably the last thing on your mind when you stop at your favorite quick-service restaurant. Whether it’s McDonalds, Burger King, Taco Bell or Subway, does it really matter what the item is wrapped with? As a matter of fact, it does. 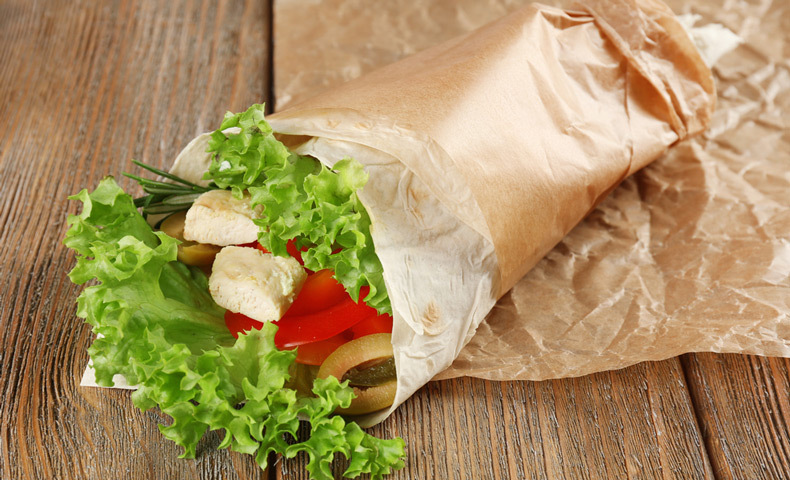 Sandwich wraps and other food packaging papers help keep your favorite foods fresh, secure and drip-free. They also do a great job of advertising your favorite brands and products. Did you know that Domtar produces a wide range of lightweight food packaging paper for well-known chains across North America? Most Domtar papers are customized to meet a customers’ food packaging need. Rather than offering a one-size-fits-all product, we take a solutions approach to filling customer needs. Our papers have a variety of custom properties that can make them suitable for a wide range of applications. Our grease-resistant papers are formulated to help prevent oil and grease from penetrating the paper. This helps the finished product maintain its appearance and keeps diners from getting grease on their fingers and clothes. Different products require different levels of grease resistance. This grease-resistant formulation can stand alone, or it can be combined with other paper enhancements to meet our customer’s specific product needs. Some food packaging papers need to stand up to the rigors of heating and baking. These applications include baking papers and wraps for toasted sandwiches. Some food packaging papers must retain their strength in wet conditions in order to withstand converting processes and end use demands. Domtar processes its specialty paper specifically to maintain strength so that it won’t fall apart when it gets wet. Juicy sandwiches and foods subjected to refrigeration and freezing are examples of applications that require paper with wet strength. Would you like bleached, dyed or unbleached paper with your sandwich? We make all three types. So how does Domtar’s food packaging paper get from the mill to the dinner table? Our food packaging paper can be made in one of five Domtar mills: Espanola Mill, Port Huron Mill, Nekoosa Mill, Ashdown Mill or Hawesville Mill. All of the food packaging paper produced by Domtar — and we produce more than 100,000 tons of it each year — must comply with guidelines set by U.S. Food and Drug Administration and other governmental regulating agencies. Our paper is sold to specialty converters who cut, rewind, print, fold, glue and shape it into many different food packaging applications. These converted products are then sold and distributed to quick-service restaurants for a variety of applications, like sandwich wraps, cookie bags, french fry bags, take-out bags and more. Products can also be sent to food manufacturers. Quick-service restaurants are our biggest food packaging paper customers, but Domtar also makes food packaging for retail, confectionary and food service applications, such as sugar packets. Our paper also goes to bakeries, supermarkets and butcher shops. So the next time you stop at your favorite quick-service restaurant or unwrap a snack at home, take a look at the wrapper before you take a bite. There’s more to your food packaging than meets the eye, and it’s very likely that it was made from Domtar paper.